JNN 02 May 2014 Riyadh : Saudi Arabia staged its largest ever military exercise in a show of strength towards its northern Shiite neighbors, Iran and Iraq. 130,000 troops were involved, while the Gulf nation also unveiled missiles purchased from China, local media stated. Saudi Arabia sees Iran and Iraq as threats towards its kingdom, while the country is increasingly worried about the tight alliance that is growing between the two predominantly Shiite nations. The General Chief of Staff, Lieutenant General Hussian Al Qabeel said, “We are preparing our armed forces to protect the nation. The armed forces do not aim to attack anyone as this is not our wise government’s policy,” Al Qabeel added. The exercises coincided with the ninth anniversary of King Abudllah’s accession to the throne, while there was also a military parade, which attracted a number of dignitaries from around the Arab world. Saudi Arabia unveiled Chinese CSS-2 intermediate-range ballistic missiles publically for the first time, which were bought in 1987 during the Iran-Iraq war. According to al-monitor.com, the deal was arranged by Prince Bandar bin Sultan, who was previously the Saudi ambassador to the United States of America. Who has been very Critical in Pursuance of War against Syria, as he was the One to even threaten the Russian President Putin from His so called Chechen terrorists , which he claims are under his command . And He was the One , Due to which there was a Dispute between the Persian Gulf Countries , and the Division arose , which was later , diluted when he was removed from his Position of the Interior Minister. 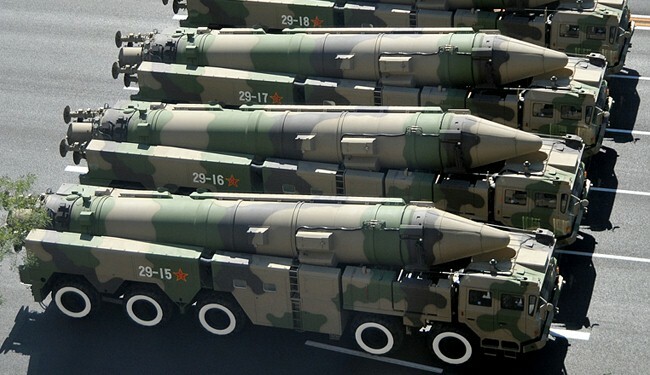 The missiles carry nuclear warheads in China, though Bandar has assured Washington that Saudi Arabia’s missiles do not have nuclear capability. Saudi Arabia has been watching developments in Iran closely concerning Tehran’s nuclear Capabilities , while at the same time Tehran Openly refuses to have any ambitions of Developing Nuclear Warheads . General Raheel Sharif, who is the Pakistan army’s Chief of Staff, was also in attendance at the parade. There have been rumors that the PML – N Govt in Islamabad is willing to provide nuclear warheads for the CSS-2 missiles, which would be a deterrent to Iran, should it ever acquire nuclear weapons of its own. And as it is also to be considered that Saudi Arabia has already Given an Amount of USD1.5 Billion to the PML – N Govt , the details of which are still not clear as under what Package this amount , has been given to the Pakistani Nation , while it is also learnt that another Big Amount is also in the offing By the Saudi Government , which is widely translated in the Social Circles of Islamabad that actually these Payments are being done as the Payment against the Pakistani Nuclear Warheads which may be supplied Covertly , Under the deal to make the Saudi Military Might in the Region . Presence of General Raheel Sharif at the Saudi Military Exercise is also being Watched very closely by the Concerned Circles , as on the One Hand he Promises to cleanse the Menace of Saudi Infested Talibanized Terrorism from the Pakistani Soil , while on the Other Side , Hand in Hand with the Same Devilish Monarchy , as his gracing the Event of Saudi military Power with his Presence , which is widely Questioned in the Intellectual Circles of Pakistan , as What is the Real Picture . As after the First Phase of Strikes of Pakistan Army against the Terrorist Hideouts in North Waziristan , Now all the things has been Hushed up Under the Carpet , while at the same time Taliban have come up Once again with a Much tougher Stance and as they Have even ended their Seize Fire , which they Practically never implemented , but now they have Openly called off their Seize Fire , and Openly attacking and Killing Innocent Pakistani , whether Civilians or the Personnel of the LEAs, as it looks now that the Military and Civilian LEAs are at the Mercy of these Terrorists , as they can not take any Action against the HideOuts of these Terrorists, under the Pretext of Negotiations with the Terrorist Organisation , Namely Tehrik e Taliban of Pakistan , which has Killed thousands of Pakistani Civilians and Military Personnel , and have not even claimed their Killing , but have even Posted Videos of their Brutal Slaughtering , but even then Warm Welcome is given to them , to the worst enemies of the State and the Islam , Just to Appease the Saudi Monarchy . This entry was posted in Asia Pacific, Jafria, Middle East, Pakistan News and tagged iran, Nuclear Warhead Capable, Saudi Arabia, Saudi Missiles. Bookmark the permalink. ← Egyptian Wahabi Cleric issues fatwa “ It is Ok if the WIFE IS RAPED , as long as the HUSBAND IS SAVED ”.